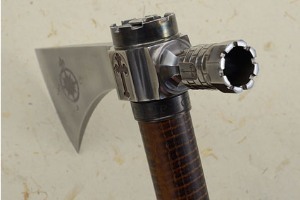 The head was hand forged from solid titanium, keeping the hawk light and nimble. 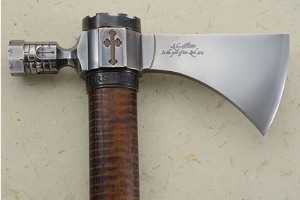 The right side of the head is inscribed: "L.C. Hansen / In the year of our Lord 2012". 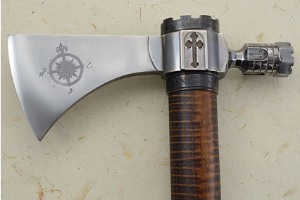 The left side features a stylized compass. The octagon bowl is sculpted and textured, moving into an octagonal neck. Both the titanium head and the pewter end cap are sculpted in a brick and cross motif. A carved, threaded titanium shield plug is easily removed for cleaning the titanium tube that travels through the haft. 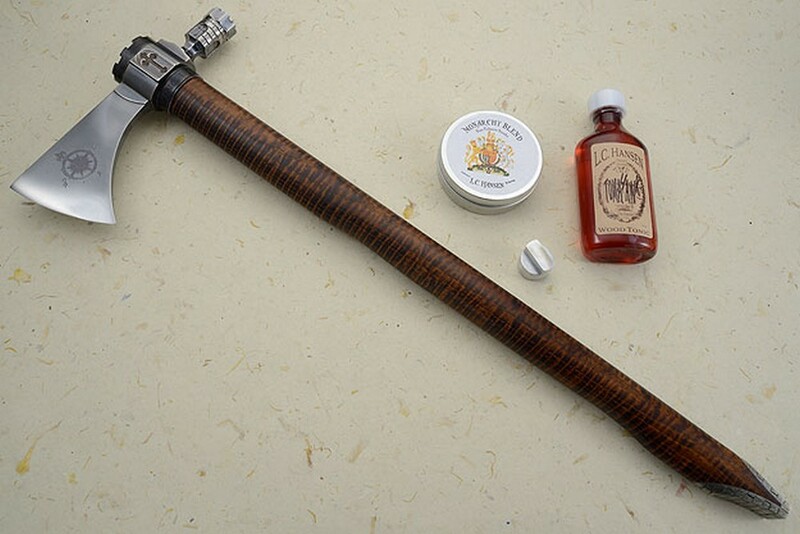 A handmade plug wrench is included. The haft is formed from presentation grade curly ash wood. The head measures approximately 8-1/2 inches from cutting edge to the end of the bowl. The cutting edge is 3-1/4 inches long. 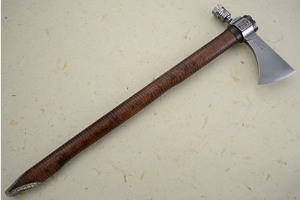 The haft measures 23-1/2 inches overall and is finished with a pewter collar and end caps. The collar is engraved with the Latin inscription: 'CHRS REGN VINC IMP' -- translated 'Christ reigns, conquers, and commands'. Exceptional work throughout. The hawk is accompanied by a tin containing Lonnie's "Monarchy Blend Non-Tobacco Smoke". When Lonnie wanted to test how his pipe hawks worked, he wanted something that could be smoked without real tobacco. He did a lot of reading and experimenting and finally settled on this formula. Everything in it is legal. Though he doesn't want to give the exact recipe, the 3 major ingredients are mullein leaf, coltsfoot leaf, and mugwort. The hawk is also accompanied by his Wood Tonic, which helps protect the haft for generations to come. 0.31201171875 0.07763671875 312.01171875 77.63671875 Trailer Started.